Today, there are more Arizona residents wearing affordable braces in Arrowhead than ever before. Some factors that may influence this include; more Arizona dentists offer affordable braces, there are more types of braces to choose from, and adults are more willing to wear clear braces like Invisalign braces and ClearCorrect braces. Let’s take a look at some different types of braces and discuss which are more appropriate for children and which are more appropriate for adults. Many Arrowhead dentists are highly trained to catch minute problems with growing jaws and emerging teeth. While the average person might fail to notice these irregularities, an orthodontic evaluation allows for early detection of problems, some of which can only be corrected while a child is still growing. Since each case is unique, the dentist may take one of several approaches in dealing with your child’s teeth. In some cases they will choose to monitor an issue until the ideal time to treat it, while in other cases they may initiate early treatment that will shorten the time the child will spend wearing braces later on, or possibly even prevent a problem from occurring. The days of heavyweight metal braces and headgear are past. Advances in dentistry have resulted in several new types of braces for both kids and adults. When it comes to modern orthodontics in Arrowhead, there are numerous options available. Today’s metal braces are not giant metal bands that encompass each tooth, connected by heavy brackets and arch wires. Instead they are lightweight, with smaller brackets bonded onto each tooth. Arch wires have also become lightweight and much more comfortable. 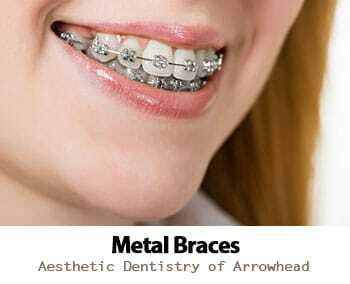 • Metal braces are usually the most cost effective. • They often achieve results more quickly than clear braces. • Children often enjoy customizing their braces with colored elastics. • They cannot be removed, thus eliminating lack of compliance or loss of equipment. • Children sometimes look forward to getting braces as a sign of growing up. • If your child feels self-conscious about wearing braces, traditional metal braces are the most noticeable form of braces. • There are dietary restrictions, such as staying away from hard or sticky foods that can break wires or detach brackets. • Traditional braces can be hard to keep clean since the hardware can be difficult to brush around. • Dental hygiene practices are more complicated since you will need to thread floss around the wires. • Metal brackets and wires can irritate the inside of the mouth, but your dentist can supply you with dental wax to cover any sharp places. There’s never been a better time to get the smile you’ve always desired, since there have never been so many choices available in braces. The newest form of braces is has quickly become the most popular, especially among adults. Clear braces such as Invisalign braces and ClearCorrect braces consist of a series of personally fitted, clear, plastic teeth aligners that resemble a mouth guard. When in place, they are practically invisible. • There are no dietary restrictions, since the aligners are removed when eating. • Your dental hygiene can continue as before, with the simple addition of cleaning your aligners. • No need to thread floss around arch wires. • Clear braces like Invisalign braces and ClearCorrect braces are much more comfortable to wear since there are no brackets or wires to poke or irritate inside your mouth. • Every two weeks, the aligners must be removed and replaced for your teeth to continue to move toward the desired result. • Clear braces must be removed each time you eat, which can be embarrassing when dining out. • Since clear braces must be removed for eating and drinking there is always the danger of losing them. Ceramic braces may be best suited for adults. They consist of brackets and wires the same as metal braces, except the brackets are made of either clear or tooth colored ceramic. Some dentists also use clear wire. • They usually work more quickly than clear plastic aligners. • They are less obvious than traditional metal braces. • They may be better suited to adults as they can stain easily. • Dental hygiene may require more effort to prevent staining. • Ceramic brackets break more easily than metal brackets. • Ceramic braces are more costly than metal braces. Lingual braces are the least popular type of braces. They use the same components as traditional metal braces, but they are mounted on the backside of the teeth. • Lingual braces are completely invisible when you smile. • Lingual braces are more expensive since adjustments are more difficult and time consuming for the dentist. • They are the most uncomfortable type of braces due to having all of the hardware facing your tongue. • They are also the most difficult to clean. While any of these types of Arrowhead braces will work well on an adult, lingual and ceramic braces pose numerous difficulties for a child. Although children may want Invisalign braces or ClearCorrect braces it requires a great deal of responsibility to take them out each time you eat and not lose them. You know your child’s capabilities best. When you don’t feel confident about your smile, you just don’t feel confident, period. 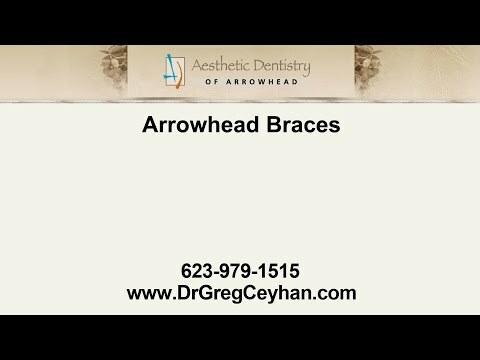 Call Aesthetic Dentistry of Arrowhead to schedule a consultation with Dr. Greg Ceyhan. 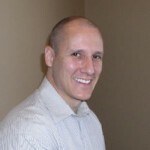 He and his compassionate dental team will discuss all of the pros and cons of each type of braces and assist you in determining the best course of treatment for your unique case.